Coughs can be tricky things to treat sometimes. Homeopathy can treat coughs very successfully but sometimes as a beginner prescriber, it is tricky to know what symptoms to take into account when choosing a homeopathic cough medicine. This article describes what to look for when taking a cough case, and oulines the 6 key reasons to treat a cough. Part 2 in the next issue,will share the specific homeopathic medicines I recommend for cough cures. Should we always treat a cough? We live in a culture in the western world where we have a tendency to think that every time we have a physical symptom that makes us slightly uncomfortable, we should remove it at all costs. Homeopaths see symptoms as effective ways for the body to get better. An acute cough is the body’s usual way of clearing the chest or throat of mucous or sputum so it has a very important function in your body. So if a cough is productive, loose and only slightly uncomfortable; and in addition, changes as the infection it is clearing progresses in a positive direction, it is best to let nature take its course. This is when we can marvel at how clever our body really is! If however it is clear that the cough is not changing in a positive direction and is not helping to improve the health of the patient, then this is a perfect time to whip out this article and get your homeopathic hat on! When it is dry, unproductive and or painful for more than 12-24 hours. When it is causing significant sleep loss beyond 1-2 nights. When the chest is full of mucous and the cough is ‘loose’ but does not appear to be clearing the chest (watch this one particularly with small children). When there are other symptoms along with the cough such as a very painful throat or sore head or chest. When there is a high fever present. When the patient is very debilitated or weak. If you have an infant or a young child with a chesty cough, I recommend that you take your child to an health professional who is experienced in listening to chests. Small children can go down-hill very suddenly, so it is important to understand if they have chest congestion and how severe it is before you go ahead treating it yourself. If a patient of mine cannot get to my clinic so I can listen to their chest, then I always suggest they go to their GP or MD and call me back afterwards for a prescription. There are curently studies being conducted on whether they are even safe for the under 6’s so having Homeopathy as an alternative is even MORE important! My advice is always that if you are sure there is no pneumonia (or in the case of an infant, broncheolitis), and no asthma, then you can effectively and safely treat your acute cough yourself homeopathically. 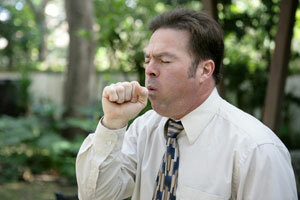 If the cough is chronic, then you will need to seek the advice of a professional Homeopath. So How Exactly do you take an Acute Homeopathic Cough Case? Is the cough dry or loose or tickling? Is it paroxysmal (in coughing fits) or spasmodic? Is it worse in the day or night or at a particular time? What makes it better/worse? Sitting/ eating/ warm or cold drinks/ or sleeping/ or being inside/outside / or in certain weather conditions? Does the patient expectorate (cough up mucous/phlegm)? In the case of a child, watch for them swallowing after coughing. If so easily/only at particular times/with difficulty/never? Does the cough have a particualr distinctive sound such as a croupy bark/like a saw? 8. Is there a strong other symptom that occurs with the cough such as nausea, gagging, fear, headache, sore chest, sore throat, fever? Once you have determined the answers to these questions you will be ready to select your Homeopathic Cough remedy. If you need a professional consultation for your chronic cough, find yourself a local Homeopath or book a skype online consultation with me and let’s get to work! In my next post called “Homeopathic Cough Cures Part 2: Common Curative Homeopathic Cough Medicines”, I will outline some homeopathic cough treatments and explain how to use them. In the meantime….. I have a chronic cough from allergies and asthma. I have not found a treatment to help. The cough is wet, with a runny nose. Please help I am sick of all the Meds I can’t afford and don’t help. Lisa you sound like you need to visit or get treatmnent from a homeopath. Feel free to book in with me if that suits as I work via skype or your local Homeopath. Homeopathy will soon have that cough eliminated without drugs!